Photos copyright of individual contributors. 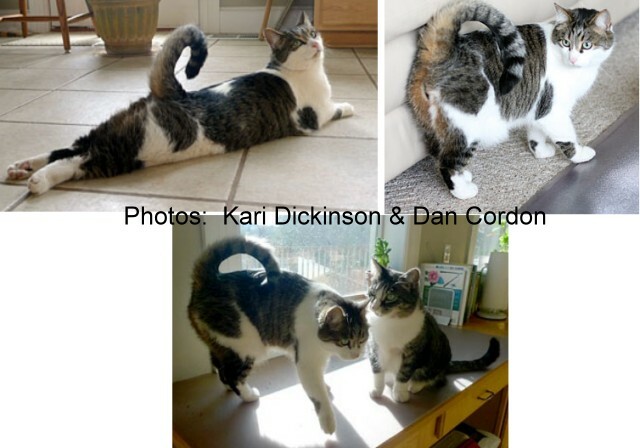 Curly-tailed cats are more common than originally realised as this page of photos shows. Initially believed to be restricted to only a handful of cats, visitors' photos show this charming and harmless trait has often been overlooked. Tails vary from looped, corkscrew and even tails that lie flat along the spine. 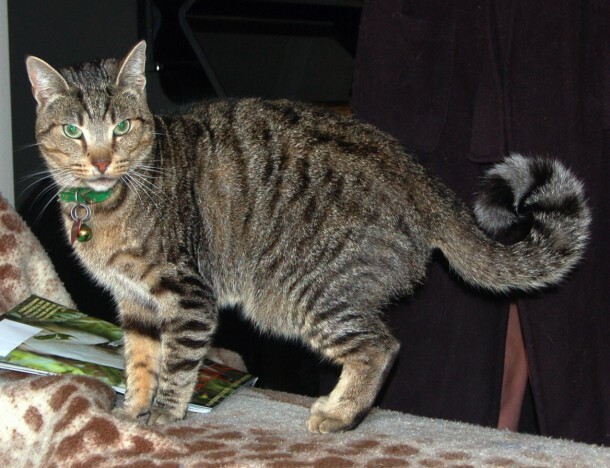 Due to the number of photos and descriptions contributed by visitors to the Tailless, Bobtail and Curly Tailed Cats page, a separate page has been created to improve loading times. Tara Fettig from Illinois, USA, sent these photos in January 2019. In 20 years with farm cats she has never had a curly tailed kitten, so perhaps the father was a roaming male from another farm. She has no intention of getting rid of her curly tailed cats because they are so unusual. 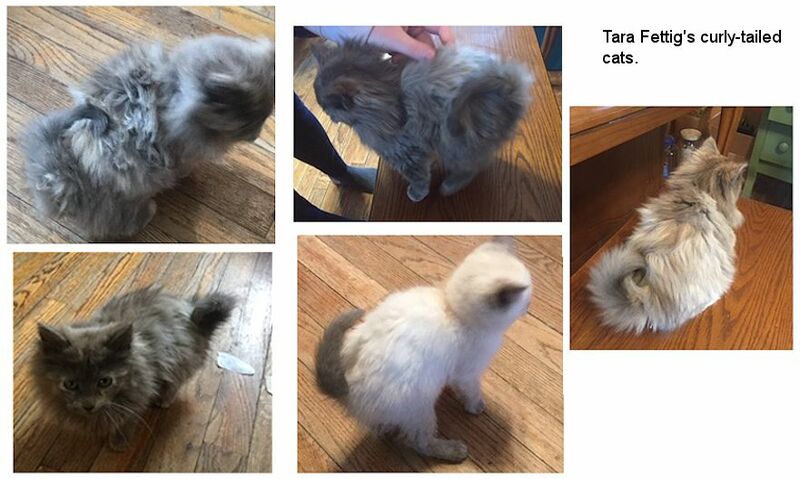 The grey longhaired kitten is the one with the most pronounced curly tail. The sealpoint (McGuffin) is her sister and there is also grey shorthair female whose sister who curls to a lesser degree. The longhair grey is named HubbaWubba NubbaBubba (named by Tara’s children!) and is so fluffy that her tail gets hidden in her fur (and she won’t stand still for photos) . The mother of the three kittens is a tortie and the father is unknown, but is suspected to be a visiting grey-and-white longhair. On October 2, 2005 Lisa Shock of Phoenix, Arizona, USA found a tiny 1lb kitten in her yard. She was very sick, and, according to the vet, about 4 months old -and a marble-patterned Bengal. She was immediately very friendly and liked to sit and sleep on Lisa's shoulder. She also curled her tail up very tightly to one side or the other (no preference) when sitting and would walk with it curled underneath her backside between her legs. She could straighten it out, and would do so when running around and excited, except for a small bend at the end. Even though she has regular vet visits, he has never seen her tail curled because she gets too worked up. As she grew up, the tail remained curly and gained strength. It's almost prehensile, she can wrap it very tightly around my fingers, arms or legs. Also, if she is angry, she will whip it, curled, from one side to the other, hitting her 'flanks' with it as she walks. She is clearly a runt, weighing about 9 pounds, with short legs for a Bengal. She was part of a group of feral cats in my neighborhood, and, the cat we believe was her mother was very large, maybe 22 pounds or so (resembling a Bengal in siz and pattern) She does have super-soft, very short fur which was in the 'ugly greys' when I found her. She developed more rich chocolate coloring later, and now, at age 9, is losing some of that color and becoming paler. Eunice Kirkman’s Leroy (for big bad Leroy Brown) was rescued from a group of boys who were mistreating him. Eunice adopted him 13 years ago. As a feisty kitten, he looked more like a dirty dish rag, but has matured into a handsome longhaired fellow with a tail that curves over his flank. Crystal Davis’s cat, Spookie, has a curled tail due to a neurological disorder. Over 8 months, Spookie’s tail has progressed through "full tailed" to "flat to back" to "aerial" to "flank curled" in that order. Crystal has been sharing her information with several veterinarians to try and help Spookie overcome other problems caused by head trauma. a Most of the curly tailed cats on this page are genetic mutations, but Spookie's case is different. As a 3 week old kitten, he was taken to the vet clinic with serious head trauma in October 2011. Crystal was fostering kittens for the clinic and offered to rehabilitate the kitten if the vets thought it was survivable. Spookie’s recovery was slow. At first he could only walk in circles to the right (a neurological symptom). He also is mostly blind in one eye due to the trauma and because of it he has anisocoria (where one pupil is larger than the other). As he grew his tail went from being "normal" to laying parallel across the top of his spine. Eventually his tail laid over his haunches in a curl similar to that of a Spitz dog breed. At 9 months old, Spookie experienced hind leg weakness, wobbly or "drunk" walking and problems with depth perception. He also has facial neurological issues. He has been diagnosed with issues affecting his lower motor neuron function, possibly due to an infection or degenerative disease. Spookie was put on steroids and antibiotics to try and rule out infection. Despite his issues, the photos show that Spookie is a happy cat with a good quality of life. His condition is regularly assessed by vets. Crystal recommends that anyone who suspects their cat has a curly tail due to injury should have the cat checked by a veterinary neurologist. Ringo, nicknamed Stink (so called because of the poor condition he was in when found) is owned by Brenda Joy. 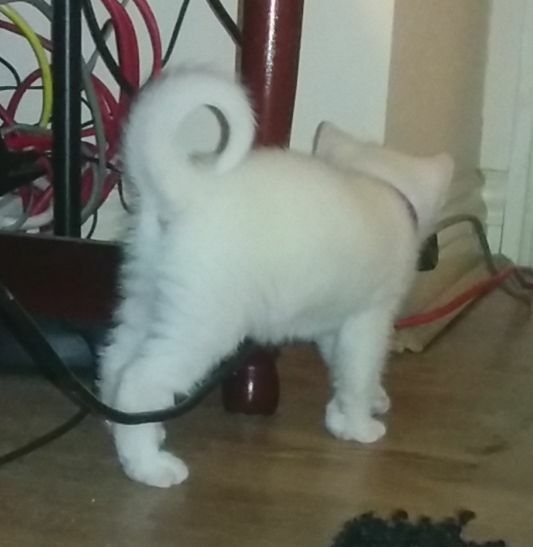 He was a sickly feral kitten found near Adelaide, Australia and the vet who treated him was impressed by the curly tail, never having seen one quite like it. The vet has since seen another similar cat so the gene appears to be in the local feral population. Stink can straighten his tail, and it is somewhat prehensile, because he can wrap it around Brenda's arm when she pets him. When he is very happy, it sits perched on the top of his rump, like a doughnut. 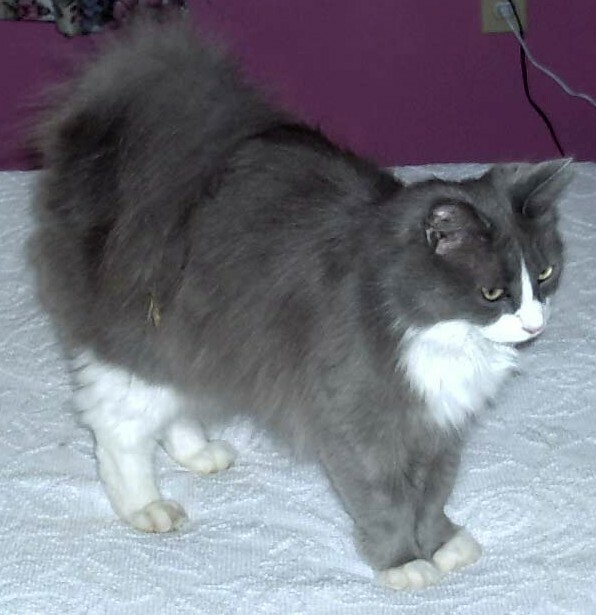 Kari Dickinson and Dan Cordon of Moscow, Idaho, USA have a male cat named Everest that started exhibiting a curly tail at 4.5 years of age. 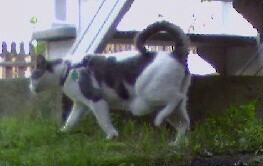 Prior to that, he naturally carried his tail straight up or just slightly curled forward. Everest and his normal-tailed brother, Jemani, were born to a feral cat and hand-raised at the local animal shelter. They were adopted at 4 months of age. 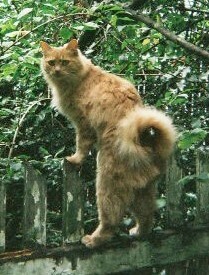 Everest can carry his tail uncurled, but most of the time its tip curls slightly to either side of his spine. The tail has a full range of motion and he can move it in any direction at will. If his tail is pulled straight, it will return to a curl when released. When Everest sits or lays down, his tail is typically straight. The photos show Everest with his curly tail and also his normal-tailed brother Jemani. Everest frequently stretches out on the floor with his back feet straight out behind him. 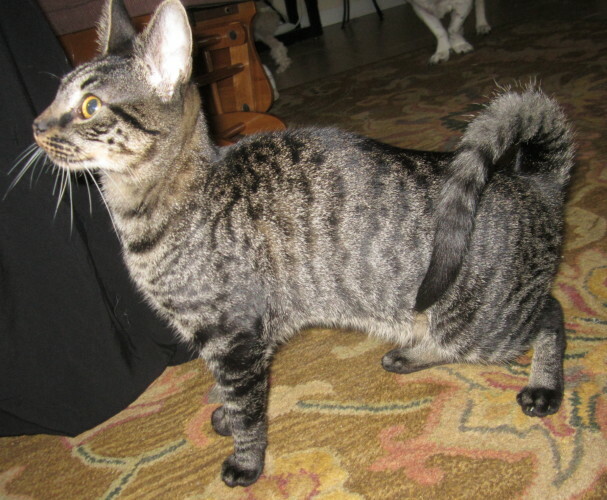 Cory Hofseth's Savannah X Pixie Bob kitten (August 2009) might be expected to have a bobbed tail, but has a cockscrew tail. 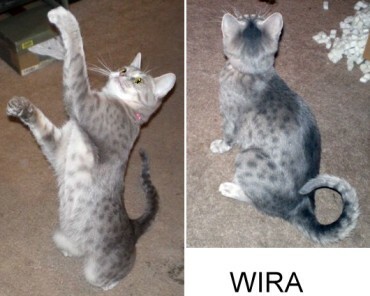 Doug Barnhart's pedigree Ocicat Wira's full name is Catiator's Fly By Wire and both her parents were show cats with straight tails. Wira can relax her tail and/or carry it like a normal cat's tail, but 90% of the time she has it in the curly formation. She often uses it as a balance point, so she can sit upright, like a Meerkat. Desert is a curly-tailed 2 year old blue bicolour owned by Jazmin Powell in 2008 (he was looking for a new home as an only cat). These photos from Lilleah West show a curly-tailed colourpoint kitten in July 2008, its mother and littermates. He can move the tail but not uncurl it; it curls downward and he holds it to the right. The photos show him as a newborn and a few weeks later. Annie Oakley is a cream tabby owned by Joy Campbell of Portland, Oregon. Annie was 7 years old in 2007. At about 6 months old, Annie Oakley's tail showed a marked curliness. In addition to the curly tail, she relaxes like a Ragdoll and has LaPerm-like ringlets on her belly.